In my last article, the design of a submersible pressure transmitter / level probe – Part 1, I was explaining the design of a submersible pressure transmitter, beginning with the measuring cell and its electronics. Specifically with respect to the media resistance and watertight sealing, great attention must be placed on the physical design characteristics of a submersible pressure transmitter. For instance, the development of a level probe requires an optimised design of the housing, a special cable design, a very application specific selection of suitable materials for the cable used and a fail-proof design of the cable inlet to join the cable watertight with the housing. The key requirement for a submersible pressure transmitter is the resistance and watertight sealing against the liquid being measured. 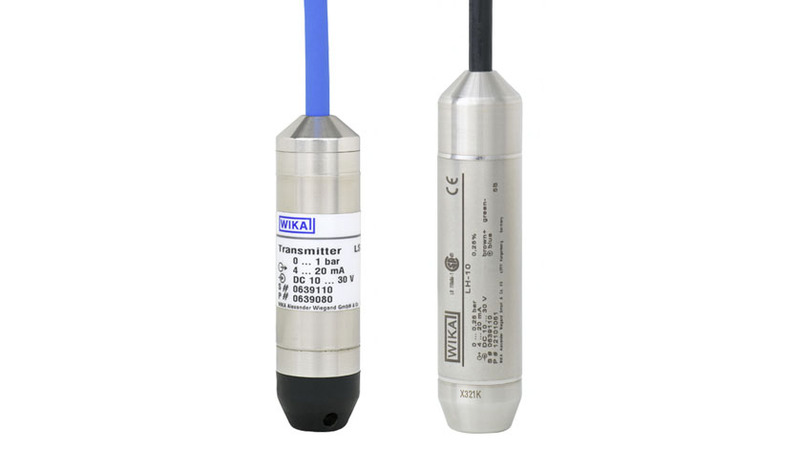 Due to these requirements, it is always recommendable to choose a high-quality submersible pressure transmitter, such as the WIKA model LH-20, with a choice of materials matched to the medium, a transmitter that has been built and tested specifically and exclusively for submersible level measurement. Basically, a housing material that is suitable for the medium to be measured must always be selected, to prevent chemical dissolving processes and electro-chemical corrosion. For application in non-critical media, the choice of a stainless steel, such as 316L, is recommended. In applications with aggressive media, however, the use of a housing material specifically suited to the harsh media, such as Hastelloy or titanium, is required. Further information on the prevention of corrosion and electrochemically-induced failures can be found here. One of the weakest points of many submersible pressure transmitters is the connection of the cable to the housing. This interface demands an optimised, hermetically sealed design which guarantees a high resistance against the ingress of moisture, under the surrounding water pressure of large immersion depths and the effects of aggressive media. It is important to avoid products whose design of a submersible pressure transmitter is based on a standard industrial pressure sensor “customised” with an optional cable outlet. A submersible pressure transmitter which is expected to work reliably and, above all, continuously even in the harshest of environments, needs to be a product that has been developed specifically for this application. A slight pollution of groundwater, a damaged pump or even a failure in the local water supply and wastewater treatment is the constant danger of an unsuitable product. The cable represents the most important distinction between submersible pressure transmitters developed specifically for this application and poorly designed “level probes”. The cable of a submersible pressure transmitter is permanently exposed to the direct effects of the media and the surrounding hydrostatic pressure in the respective immersion depth. With an improper selection of material, there is a permanent risk of fluid ingress into the cable through transversal water pressure and thereby the risk of a failure of the level sensor. Specialised manufacturers such as WIKA therefore offer the user a comprehensive selection of cable materials, in order to enable the highest media resistance and thus process reliability for the target application. The user can select from a choice of tested cable material suitable for the application, depending on the aggressiveness of the liquid being measured, e.g. PUR cable for standard, non-critical applications, or FEP cable for aggressive liquids. Last but not least the mechanical properties, i.e. the mechanical durability, of the cable used, must be taken into account during the development of a level probe. For example, the cable material must offer a maximum pressure resistance, even in the largest immersion depths such as in deep wells or groundwater monitoring. Furthermore, the specific strength of the cable, with respect to the weight-related stretching load and the direct mechanical influences with regard to bending over edges and other associated wear and tear, becomes very important. All of this assists in the goal of preventing media ingress of the liquid into the cable, effectively and permanently. Further information on the prevention of media-ingress–related failures in level probes can be found here. WIKA offers comprehensive solutions for your hydrostatic-pressure level measurement.For further assistance in selecting the pressure sensor most suitable for your application, please use our contact form.